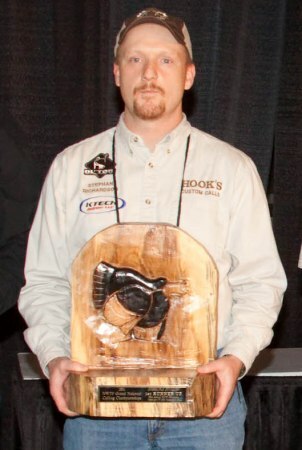 NASHVILLE, Tenn. — After displaying nerves of steel and amazing skill, Stephan Richardson of Springdale, Ark., finished in second place in the Gobbling Division at the Grand National Turkey Calling Championships Feb. 17. Each year, the National Wild Turkey Federation hosts the Grand National Turkey Calling Championships at the NWTF National Convention and Sport Show. Dozens of the world's best adult and youth turkey callers gather to test their skills in front of a panel of expert judges. Stephan Richardson of Springdale, Ark., finished in second place in the Gobbling Division at the Grand National Turkey Calling Championships Feb. 17. "When we call the name of a new grand national champion, the atmosphere in the room in electric," said George C. Thornton, NWTF CEO. "It takes a special talent and years of practice to master the sounds of a wild turkey. To become a champion on our stage is the most prestigious honor a turkey caller can achieve." This year, champions will be crowned in 10 divisions at the 35th annual NWTF convention, which is sponsored by MidwayUSA and housed at the Opryland Resort and Convention Center in Nashville, Tenn. In the Gobbling Division callers imitate the gobbles and drumming of a male wild turkey. Overall, the winners from each division competed for their share of more than $25,000 in cash and prizes. The NWTF National Convention and Sport Show attracts tens of thousands of hunters and outdoor enthusiasts who explore a sport show that's almost the size of five football fields, meet their favorite celebrities from the hunting industry and watch the world's best turkey callers compete. In 2012, the 36th annual NWTF National Convention and Sport Show will return to Nashville and the Opryland Resort and Convention Center, Feb. 9 to Feb. 12. Founded in 1973, the NWTF is dedicated to the conservation of the wild turkey and the preservation of our hunting heritage. Through dynamic partnerships with state, federal and provincial wildlife agencies, the NWTF and its members have helped restore wild turkey populations across the country, spending more than $331 million to conserve 15.9 million acres of habitat for all types of wildlife. The NWTF works to increase interest in the outdoors by bringing new hunters and conservationists into the fold through outdoor education events and its outreach programs - Women in the Outdoors, Wheelin' Sportsmen, JAKES and Xtreme JAKES.